Welcome to Working Top Wednesday. 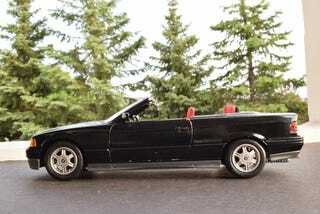 This will be a brief series where I (and maybe you, too) will feature models with working convertible tops. 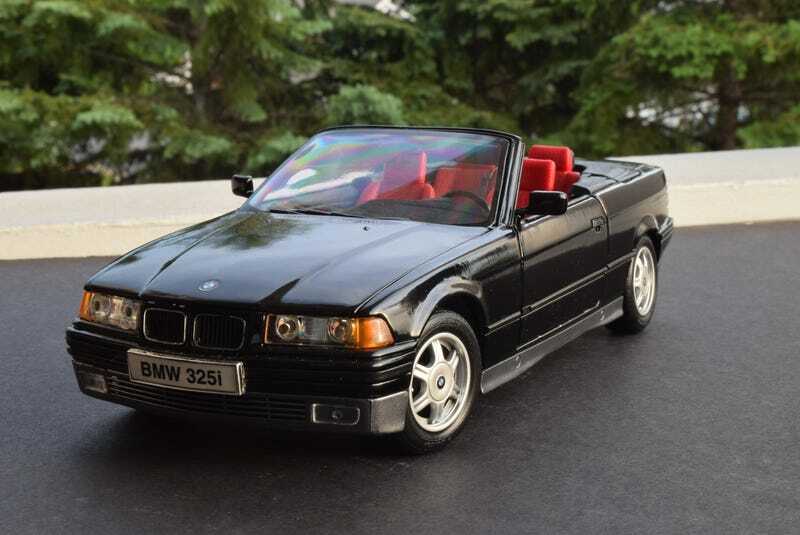 Kicking off the series is what I believe to be the oldest model with such a feature: the Maisto E36 BMW 325. This model dates back to the early 90's, and is about as bad as you can imagine a Maisto of that era would be. The orange peel in the paint is more like a grapefruit, and the panel gaps are big enough for this sentence to fit through. Of course, we can’t talk about a 90's Maisto without talking about the 1:1 size leather grain texture that just ruins what would otherwise be an acceptable interior. Surprisingly, the top is the best feature of all. Now I know you’re looking at the pictures and wondering when did Illinois become a legal weed state, but the top is, or was, pretty well done. Unfortunately time has not been kind to the glue that holds the top fabric to the cross-bows of the roof structure. One other thing about 90's Maistos is that they made a model until the dies wore out. Meaning that it is still widely available on ebay and it’ll probably never be rare, so you can still pick them up for about $20. Should you decide to get in on this top down action, note that Maisto also made a top-down only version and the only distinction made on the box is a picture of the partially raised roof on the ends with a smaller one on the top.